This is a wonderful book that looks at the evolution of video games over the last few decades. I can sense the nostalgia when reading about the games that I used to play, and the consoles that I owned. 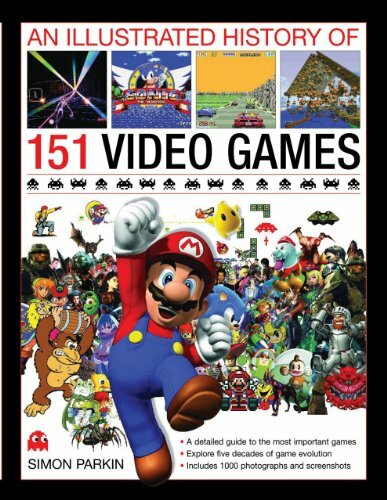 This book covers in chronological order, selected video games and the consoles that were released since the early 1970s. The first game in the book is Computer Space, something I've never heard of, and there are many other games I don't know of that are also in the book, and I think it's great. As with books that talk about video games, and list them, the criteria for inclusion is not going to please everyone. I feel that the 151 video games included are quite well chosen. There are a few games which I thought should be in but are not, but it's not a big deal. Overall, there's a huge variety of games included which makes for an interesting read. The text about the history of each game and console is informative. It's obvious they are properly researched and hence quite insightful. Author Simon Parkin has done a great job with the book. The last game featured is from April 2012 so this book doesn't have anything on the PlayStation 4 and XBox One. Again, not a big deal, but it would be great if this book could be updated in the future. Another thing I like about the book is, they included information on where you can play all the games, even the very old ones. They could be on the web, PSN, emulators or somewhere else, and all that is included in the book. Highly recommended to all who are interested in video games.